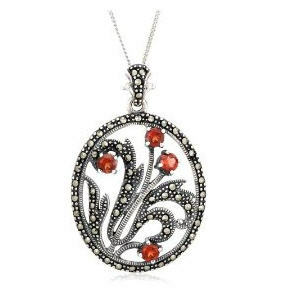 This Victorian-style floral pendant is fashioned from sterling silver and ornamented with dark marcasite stones and red garnets. 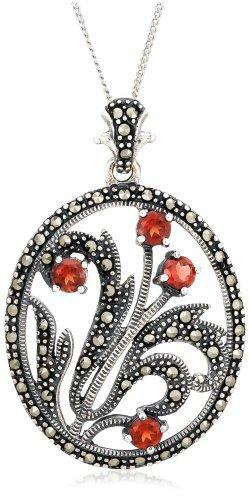 Curving leaves, etched stems, and bright garnet blossoms are featured within an oval frame. The pendant is appointed with a coordinating decorative bale and comes with an 18-inch sterling silver chain. This is a beautiful way to add a little vintage style to your look.